"41MR12, Burial I, 56" by Timothy K. Perttula and Robert Z. Selden Jr.
DECORATION: Engraved with a continuous scroll motif repeated four times across the rim. A single horizontal engraved line encircles the vessel interior at the rim-body juncture. A white kaolin clay pigment has been rubbed in the engraved lines. 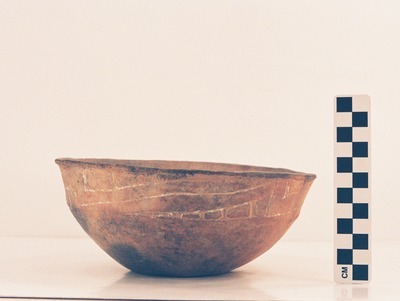 Ripley Engraved vessel, MR12-56, from Burial I at the Ben McKinney site.